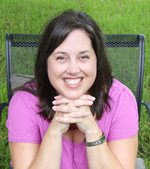 and this week's sponsor is Jennifer Buck, an independent Stampin' Up demonstrator. 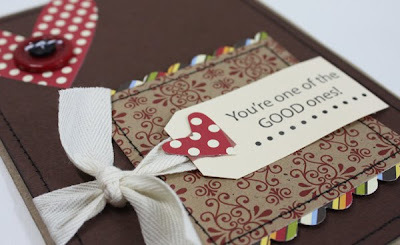 The design team really put together some awesome pieces using products from Stampin' Up. Be sure to check them out. All of the patterned papers are from Jillibean Soup, the tag is from Avery (I think tags are making a comeback), some recycled twill, Creative Cafe buttons and Martha Stewart's baker's twine in black and white. 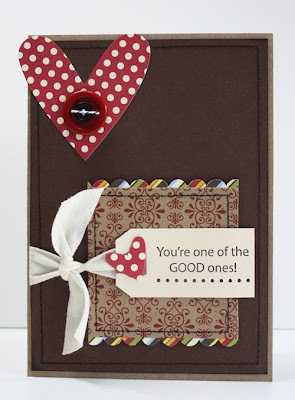 I also used some of my favorite Stampin' Up supplies, including the Sizzix Hearts & Brackets die, the scallop edge punch and a stamped sentiment from the Smarty Pants set. Add a little sewing and a little distress ink and don't forget those SU dimensionals...what did I ever do without them? I can't wait to send this one to someone special! I hope you liked it! 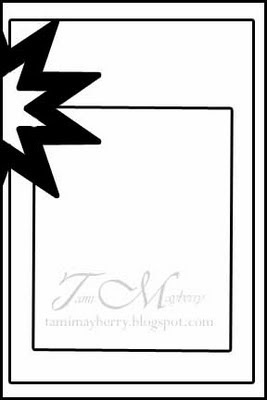 Great card! I love it! Hi! Welcome to my little blog. This is the space where I organize all of my craftiness while I dabble in a multitude of fun things including papercrafts, sewing, photography, baking, thrifting, junking, organizing, raising two girls while sharing my life with an incredibly loving husband. I hope you enjoy what you see because I really enjoy sharing what I do!